Tonight the City of Swan ‘launched’ the Draft Guildford Heritage Precinct Master Plan in the Guildford town hall. This is a significant document that will shape the long-term future of the ‘Guildford Heritage precinct’ – ostensibly Meadow street between Swan and Helena streets. But will have significant implications for all Guildford residents and visitors. The document is aimed at developing a long-term plan for the use and care of the heritage buildings, sites and streetscapes on Meadow street Guildford. The document has been prepared by a team of consultants (landscape planners, heritage architects, tourism professionals etc.) and will be available for download on the city website tomorrow. Hard copies of the report will also be available at the Midland/Guildford libraries and the Admin building. It canvasses the best uses of the existing buildings and potential alternative uses (e.g. moving the Potters, Visitor centre, or Library etc.). Three major options are proposed, but elements from all options are up for debate. It’s also a rather substantial document, ~100 pages apparently. Therefore, the City only provided a brief overview tonight and is giving residents 2 weeks to read and digest the report, before a feedback session (Monday 30th March, 6:30 pm). We encourage everyone to look at the sections of the report which interest them and make sure you come along to have input in 2 weeks time! 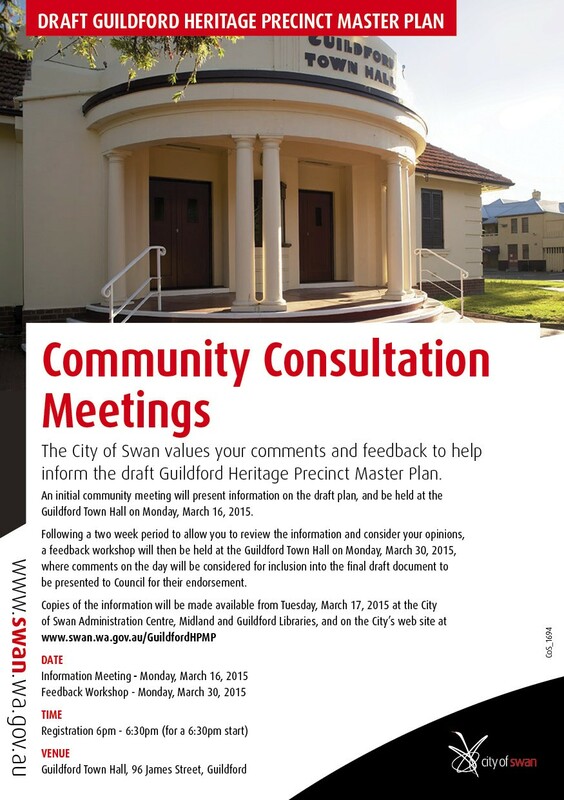 This entry was posted in Community, Economics, Take Action, Transport and tagged City of Swan, Heritage buildings Guildford, Meadow street, Stirling square Guildford. Bookmark the permalink.